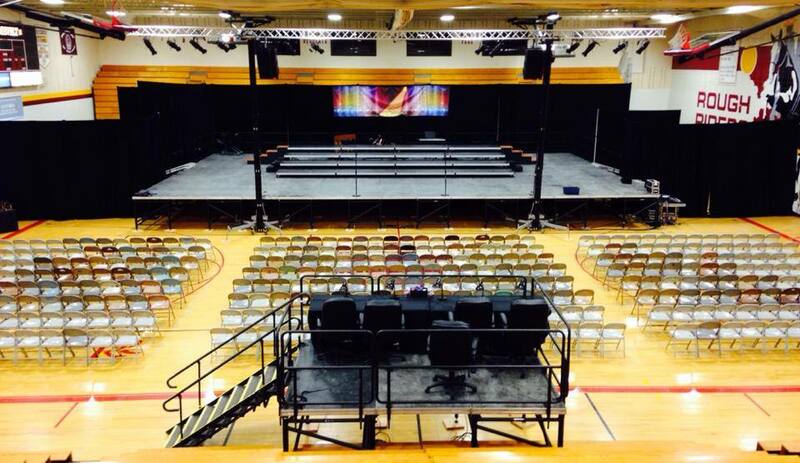 The stage in the Gym will be a raised platform stage (52X40 at four feet off the ground) with show choir risers on top of that. There will be stairs leading to the platforms and another set of stairs to the top two levels of risers. A safety railing will be installed around the back and sides of the staging. Five microphones are placed across the front of the stage, and group condenser mics are hanging overhead. Changing areas are located on the floor off the sides of the raised stage. Any props or riser extensions will be brought on stage from stage left and exit stage right. Thank you for planning that strategy ahead of time! Below is a picture of previous years' stage, but at 60' wide. The sides will not be as wide this year to aid in faster changing and to make room for a new screen stage right! Directors: Please fill out the Stage Request Form no later than January 21, 2019! We have an amazing crew and they are there to HELP! The more info they have the faster we can get you what you need for the optimum performance experience. *There will be a drum set/keyboard available for your use if you don't have them/don't wish to transport yours. Signify desire on the Stage Request Form.